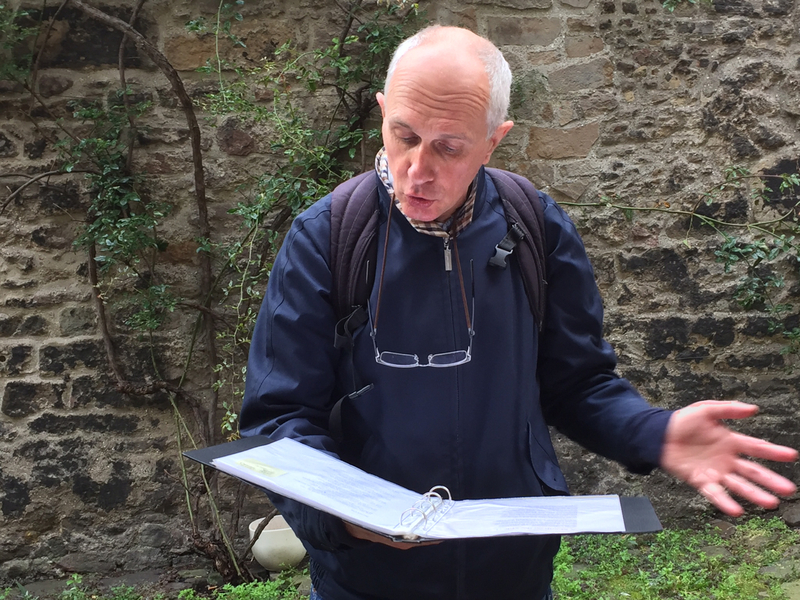 I ran two walks on National Poetry Day 2015 – Thursday 8 October – starting at the Scottish Storytelling Centre and walking down to the Scottish Parliament. The weather was kind, with some gentle autumn sun, and on the way I read poems by Christine De Luca and Ingrid Murray, Tessa Ransford, Muriel Spark, Norman MacCaig, Roberts Burns, Fergusson and Garioch, Bert Brecht, Stewart Conn, Angus Reid and Edwin Morgan, as well as the great Anon, and one of my own. I’m grateful to Elaine Erb (from Alberta, Canada), for the photographs here, taken during the morning walk. The large-scale poem on the the printed scaffolding sheet (a huge new development is being put up behind it) is ‘Spiral’ by Elizabeth Burns, installed earlier that morning. At 25 by 12 metres, it’s reputedly the largest poem in the UK, and will stay up on the building until summer 2016. This entry was posted in Canongate and tagged Canongate, Elizabeth Burns, National Poetry Day 2015, Robert Fergusson, Royal Mile, Scottish Parliament, Scottish Storytelling Centre, Spiral on October 12, 2015 by Ken Cockburn.